Who here has a Moto G? Discussion in 'Alternatives to iOS and iOS Devices' started by mclld, Oct 2, 2014. I dropped my phone in water and while it still works it has issues so I needed a replacement. I dont need high end so I ended up getting a used Moto G 8 gig on ebay for $80. It is the non LTE version and that is fine as I do not stream movies or anything. I also came across a used LTE 8 gig version for $120, I am thinking about buying it as well and then keeping which one I prefer. My main concern is battery life, with my old phone it will not last a day at all, I may get half a day if lucky. What kind of battery life do you get in real world use out of your G? Will there big a big hit if I was to get the LTE version and keep it instead? Had one. Would take it over iPhone 5s anyday because of the bigger screen. I had the 3G version. Battery life was insanely good. I've just gone from a Moto G to a Nexus 5 after getting a good offer on one and you know what I miss going from the G to the N5? The battery life! 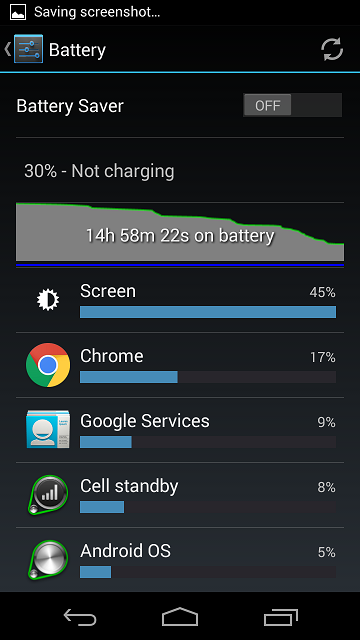 Easily one of the best smartphones I've ever used for battery and it performed perfectly for day to dsy usage. Great phone IMO. Have they arrived yet? What are your impressions? One should be here today or Monday and battery life is my main concern so that is what I am looking forward to checking out. I have considered going from the n5 to the LTE moto G for the form factor and battery life. I picked up a Verizon Moto G for $60 the other day. I use it as a WiFi device around the house and in the car with the Torque application. I absolutely love and as with the others, I'm very pleased with the battery life! My only gripe is the bootloader can't be unlocked and it can't be fully rooted. I bought two of these for my boys. they love them - great phones and probably the best bang for your buck (or pound). One had my old S2 but loves the bigger screen on the G. Battery life (so far) is great. So far at this point in the day at work my phone would be at about 25-30% and that would be with putting on airplane mode a couple times, this thing has been on the whole time and I am at 72%. The battery stats have me at 9h49m. Of course when I'm not at work it would be much lower since I would be using it more but going by this I am more than pleased and can't believe how much I like it. I will be able to get through a full 12 hour shift with plenty of battery life to spare. Press the screen, it will tell you in hours and minutes. Today was my first non work day of use and right now I am 12h 9m with 2h 12m screen time and my battery is at 57%, I am extremely pleased with this! Have one as a back up as well, great phone and the battery life is really good. I think my iPhone 6 is better but not by much! DANG. A day and a half on the battery with almost 5 hours of screen on time. That's insanely good.